If you have the budget, the Siemens iQ500 SR26T891GB is a machine that offers a great value. 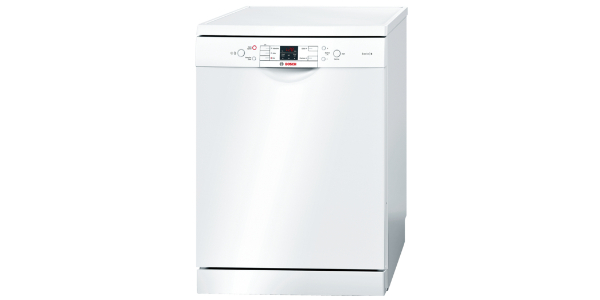 This slimline dishwasher not only has exceptional cleaning capabilities, but it is also very well made. 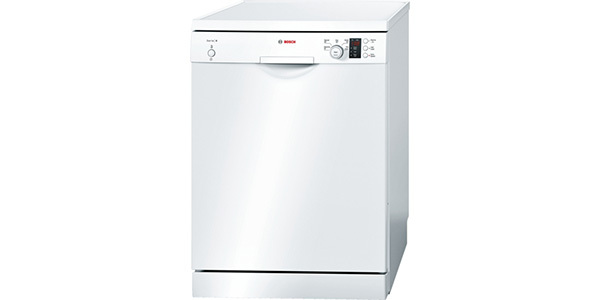 It comes with a range of technologies that are designed to deliver some of the best cleaning that you will find, and it has nice features like hygienic washing and intensive zone wash.
For a slimline dishwasher that is made to last while also providing great cleaning capabilities, the Siemens iQ500 SR26T891GB is right at the top of the list. This machine not only comes with a versatile interior, but it also has a great range of programs and functions. 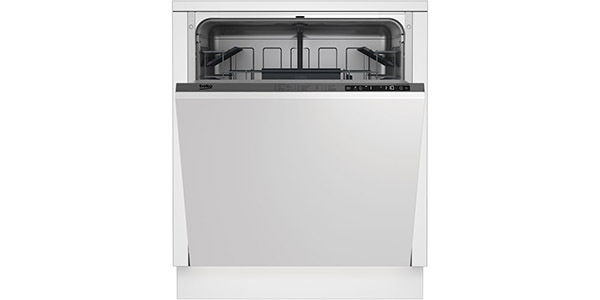 Among the slimline machines that are currently available, this one offers respectable efficiency, and it is very quiet when in operation.Being a slimline model, the interior of this Siemens dishwasher is a little limited, but the designers went out of their way to get the most from the available space. It has a third level cutlery tray, and this helps to free up more space for things like plates and cups, and it has a top rack that can be adjusted to three positions. Along with that, you have some folding racks in both baskets, and you have specialised rack solutions for things like large utensils and cups. Most buyers will be more than satisfied with the range of programs that they get from the Siemens SR26T891GB. One of the highlights is the auto program. This is your normal wash program, and it uses sensors to manage things like water temperature and wash time. Along with the convenient auto program, users also get an intensive wash, eco wash, glass care, pre-rinse and a quick wash.
All of these programs perform well, and this model comes with some great features that help to make for improved cleaning capabilities. 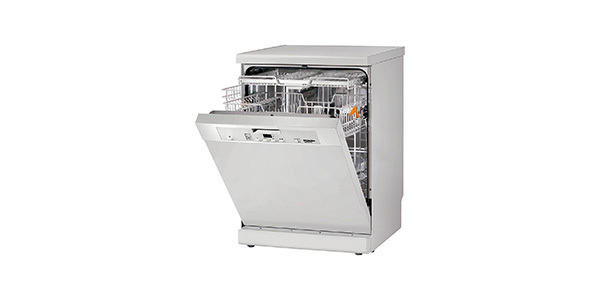 It has the DosageAssist feature for getting the full cleaning power of your detergent, it has HydroMix glass care and it has automatic load size detection. 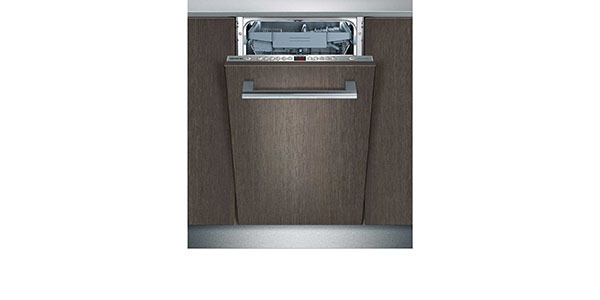 Beyond its great cleaning capabilities, this Siemens slimline dishwasher comes with a good range of features. The Hygiene Plus feature is good for adding an antibacterial rinse to the cycles, it has an extra dry feature, and it has VarioSpeed Plus for reducing the amount of time that it takes cycles to run. Along with that, you can also add an intensive zone wash to the bottom basket, and it has a delay start timer. 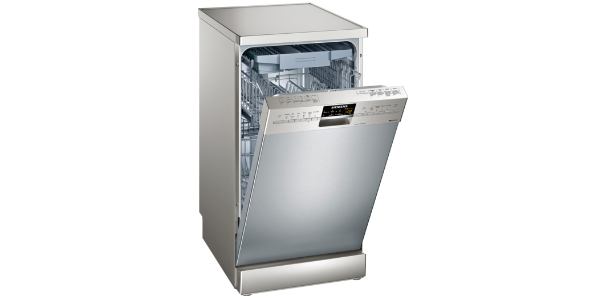 Ease of use is another area where this dishwasher does well. It is all push button controls, and it is not a complicated machine to learn how to use. Each program and feature has its own button, and it has a display that has a countdown timer, and indicators for things like low salt and low rinse aid. 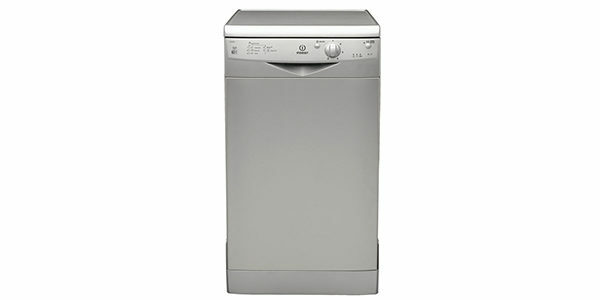 With the SR26T891GB from Siemens, you also have a slimline dishwasher that is very well made. It has a stainless steel interior, and it has the AquaStop system for flood protection. The manufacturer also shows their confidence in this machine by giving buyers a five-year warranty, and it comes with lifetime coverage for water damage.